After posting my favorite picks for “best value bourbons,” suggestions for bourbons I didn’t mention came flooding in, of course. The most emphatic was from a local liquor store owner who boasted that at $9.99 (at his store, of course), W.L. Weller Special Reserve is “the best value on the damn planet. Hands down… no arguments… FACT.” You’ve got to give him credit for offering a great price – I’ve seen W.L. Weller SR for up to $16 elsewhere. And his insistence spurred me to pick up a bottle of W.L. Weller SR to taste again. While I was at his store, he also pointed out that the 8 year old Old Charter was up there, too, in terms of value. It was also priced at $9.99 (and also goes for up to $16 elsewhere), but had a $4 rebate hangtag on the neck, so that made it $6 for an 8 year old bourbon. Now, when I find a bourbon whose price is lower than its age, I basically have to give it a shot, right? In any case, the point of all this is to put them head to head in a taste-off, and see if either would make my list of best value bourbons. Here we go…. First off, both of these bourbons show a similar, lovely orange-bronze color, the W. L. Weller is just a touch deeper. They each pour with some good body, not too thin. On the nose, I’ll start with the Weller, and have to say I’m not really loving it – it’s a bit hot for 90 proof. There’s some banana, nutmeg, caramel undertones, then a touch of green/young grain. As for the Old Charter, the nose here is definitely smoother, deeper, with more caramel and oak, though not in a heavy way. There’s a sharpness to it that hints at the rye component, but not overtly. 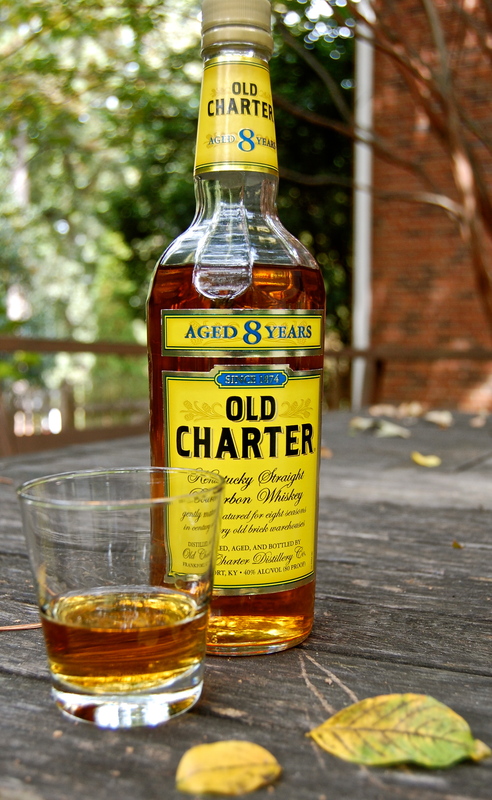 Old Charter definitely beats the Weller in pre-sipping impressions. On to tasting, the Weller shows a nice balance on entry, good mouthfeel, plenty of buttery toffee and a bit more of that banana in the background along with some baking spice. This has a nice bite to it, with a long, pleasing warm finish. I have to say, it delivers much better than the nose would indicate. A bit of water or some time with an ice cube smooths things out on the Weller considerably, into a buttery, soft caramel that is nice though not very complex. The water also takes the heat off the nose, but mutes the other notes as well. Meanwhile, the Old Charter carries a thicker mouthfeel, a bit flabby really. Butterscotch is the primary note when you taste it, less balanced and nuanced than the Weller, but with good drinkability. It’s a bit too one dimensional to me, with some slightly unpleasant sharpness on the finish. Not bad, but nothing that grabs your attention, and at only 80 proof, I wouldn’t add any water to this for sipping, though it would do just fine in a cocktail. Overall, I give both a rating of Good Stuff* – in large part because they are both great for the price. If you’ve only got $10 to spend on a bourbon, these two are great options, and I lean to the Weller, with the caveat that it could use a touch of water or ice for sipping. Both are well suited for cocktails (in fact, Holeman & Finch, among the most esteemed cocktail bars in Atlanta, uses W.L. Weller Special Reserve as a well bourbon behind the bar). It’s worth pointing out that both of these bottles are entry points for their respective brands, and for Buffalo Trace’s family of bourbons more broadly. From the Weller Special Reserve, you can step up to Weller Antique 107 proof or W.L. Weller 12 year old for older/stronger expressions; and from the Old Charter 8 year old, you can go to Charter 101 proof or 10 year old – all at a higher price, of course. It’s all about finding the bourbon that delivers best for your tastes AND your wallet. ** As for the Buffalo Trace mash bills, there is a bit of differing info from various sources online, none of which are 100% definitive. I’ve corrected my original post to reflect what I think is right for these two – any further corrections much appreciated! Buffalo Trace has one wheated mash bill for the Weller and Van Winkle bourbons. #2) lower rye for Benchmark, Old Charter, Buffalo Trace, Eagle Rare, and George T Stagg. Oops. Reversed the #1 and #2 in my first comment. Regardless, WL Weller SR does not share a mash bill with ETL, Blanton’s and RHF. Jonathan, thanks for pointing that out – that was a brain lapse on my part – I’ve corrected the post to what I HOPE is right, and added a footnote too at the bottom. Wow, I’m still learning so much about bourbon. I loved this review. I’m trying to wrap my head around the ‘mash bills’ how do you guys know about this? Is it listed on their website or is it just from going to the tours. I recently went to a Pappy tasting and the manager of the store was using these other bourbons as a comparison saying that Pappy came from similar ‘mash bills’ as these and I was confused. I’m starting to figure it out, but still in the dark a bit. Eric, thanks for reading, I don’t think there’s ever a point when there’s not more one can learn about whiskey. As for the mash bills mentioned, most of what I’ve picked up has been from reading online forums like straightbourbon.com or bourbonenthusiast.com (where some folks have insider info) and blogs like Sour Mash Manifesto or Chuck Cowdery or John Hansell. Also, Buffalo Trace is a bit more forthcoming about their mash bills now with their White Dog releases that actually call out the Mash #. You can try a wheated mash bill that is what will end up as Pappy Van Winkle 15 years from now (or Weller seven years from now). I also want to say that sharing a mash bill does not mean two whiskies will taste all that similar! There can be tremendous variation from barrel to barrel thanks to the mysteries of time+place+wood, and it’s safe to assume that Buffalo Trace has an effective means of separating out which barrels go to which brand/bottlings based on flavor profiles. Wow. Those look like some great resources. I’m definitely going to have to spend some time looking at them tonight. I’m trying to learn more and more about bourbon so I can give more accurate reviews / pairings with cigars over on my site. I have quite a few resources for cigars, but I’m always looking for more on booze! Do you have any sort of ‘tasting guide’ that you use when doing reviews? b/c I always see people mention banana as a note from bourbon and I’ve never picked up on that and I’ve been drinking bourbon for awhile now. Thank you for the review of W.L. Weller Special Reserve. I think I started drinking this 20 years ago when it was mentioned in Michael Jackson original whiskey book. Along with Old Fitzgerald, which I can no longer find. 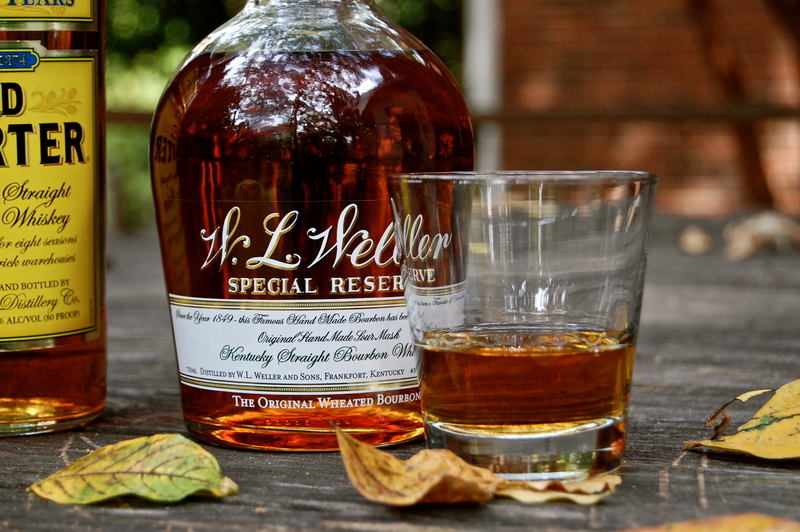 Weller is the perfect everyday celebration. In South Texas a 1.75 liter bottle goes for $27.00. I have yet to find anything that is a better value. Of course I seldom look anymore. Cheers. Gerald, thanks for stopping by Thirsty South. You may want to check out Larceny which should be similar to Fitzgerald, especially while it’s on rebate right now (see review at http://www.thirstysouth.com/2012/10/30/larceny-bourbon-review/), but I much prefer the Weller. Stumbled across this review, and I couldn’t agree more about the Old Charter. For the dollar, it’s some damned good stuff. My bottle, however, was bottled at 10 years old. Might want to check that out if you’ve got a chance. It’s a bit more expensive, as you might expect, but still a great value. Thanks, yes, I’ve tried the Old Charter 10 as well. I have friends who use that as their house bourbon. Solid stuff for the price. Found your writings a few weeks ago and really enjoying it. I’m a big fan of BT stuff, and I’ve had a hankering to try Weller 12, but haven’t been able to find it at the 2 stores near me. I’ve got my liquor monger on the look out if he gets a chance to order it, but in the mean time are there any stores around Atlanta, and even better Decatur, that usually have a few bottles of the 12? Daniel, I’ve seen the Weller 12 recently at both Green’s on Buford Highway and H&F Bottle Shop. It is not that hard to find, thankfully. If you like higher proof, check out the Weller Antique 107 proof – I think both those shops have that one, too. Excellent. I figured one of the Greens would be a good bet, will have to swing by there sometime this week. Looking forward to contrasting it with my current favorite Elmer T Lee. Have visited Milpitas CA often over the years and returned home to England with bourbon but never spotted my namesake brand in the stores.Sounds good.Must sample it next trip. 90 proof Ancient Age, also from Buffalo Trace distillery, is regularly priced under $10 (I pay $8.99) and tastier than the Old Charter, but not the aforementioned Weller. Remember that the Buffalo Trace distillery was previously the Ancient Age distillery. I must commend your excellent taste, although I prefer W.L. Weller black label, the 12yr. I’m angry that the North Carolina ABC board saw fit to scratch Old Charter from it’s buying list, so now the only place you can find it here is in a bar. But some liquor stores will special order a case of six 1.75 liter bottles, for around $140. Tim, what type of info are you looking for? I am looking for any info on the bottle . Like to know anything and everything I can find out . I have pic of it if it would help. I toured the Buffalo Trace distillery spring 2014 and here’s what they said on the tour. They use only 2 mash bills, one with wheat, and one with rye (of course both have corn and malted barley). I was focused on Weller, so didn’t pay attention to which bourbons are made with rye. The only difference in all there bourbons, except for mash bill, is where they are aged in the warehouse, and for how long. Hope this helps. Buffalo Trace distillery was the Ancient Age distillery a decade ago. Ancient Age 90 proof at $8.99 is a better taste and price than Old Charter 8 yr. old. Now if you’re talking Old Carter Proprietor’s Reserve 13 years old, that an all time great bourbon.